"At their asking price, they are simply without equal. The competition has a lot of catching up to do." Sound An "utter lack of glare or other hash in the high frequencies" along with "bass response [that] is nothing short of astounding for such a diminutive speaker." They have "a grand sense of scale." "While they can't move as much air as a speaker with much larger drivers, they can produce the heft required to listen to a full orchestral recording at reasonable levels (and even a bit beyond reasonable)." Features "A two-way design utilizing a 1" aluminum-dome tweeter and 5 1/2" Kevlar woofer." "The bass drivers of all Reference Connoisseur speakers employ Energy's patented Ribbed Elliptical Surround, which is claimed to improve frequency extension and reduce distortion." Use "Speaking of the grilles, you're only going to want to use them if you have small children with inquisitive fingers, as they do reduce high-frequency extension somewhat. Besides, the drivers are especially attractive and lend a contemporary look to the package." Value "Their sonics and manufacturing quality put them in a very competitive position with speakers in the $1000-per-pair range -- almost twice what they cost." The component of your audio system that most strongly influences the character of the sound you hear from any particular recording is the loudspeaker. Conventional wisdom has been that you should, therefore, devote 50% or more of your system budget to speakers. This course of action would make sense if cost were directly proportional to performance -- if your 50% spent brought you back 50% in sound quality. In many cases you do get what you pay for, but some companies are out to give you a little more for your money. Energy is one of the speaker brands of Audio Products International, located outside Toronto. All of the API speakers share a few design goals that came out of Floyd Toole's research at the National Research Council in the 1970s and '80s -- flat on-axis frequency response, wide and constant dispersion, and low distortion chief among them. Another trait that all API speakers share, up and down the product lines, is high value. While I have never owned a pair of Energy loudspeakers, my first audiophile-quality speakers were from Mirage and my modest home-theater system is based around the Athena Micra system. Both Mirage and Athena are API brands, and both have given me my money's worth and then some. The Reference Connoisseur series is the newest offering from Energy. Rather than being an upgrade of the well-regarded Connoisseur line, these speakers have been redesigned from the ground up. The range consists of minimonitors, towers, a center-channel speaker, and surrounds, all of which are constructed using the same drivers, so that you can mix and match speakers for home-theater or multichannel-music applications. Interestingly, the Reference Connoisseur center-channel speaker, the RC-LCR, is designed to be oriented either horizontally or vertically, so that it can be used in any position, allowing for a perfectly matched set of as many speakers as you need. The bass drivers of all Reference Connoisseur speakers employ Energy's patented Ribbed Elliptical Surround, which is claimed to improve frequency extension and reduce distortion. Rather than just being marketing hype, as with so many other concepts in high-end audio, there is some real science behind Energy's approach. The typical half-roll surround causes uneven air displacement between the forward and reverse motion of the driver. Essentially, the peaks of a sine wave are higher than the troughs are deep, resulting in distortion. Making the surround elliptical in shape allows the woofer cone to displace the same amount of air moving in either direction. The ribs, on the other hand, account for stresses that would otherwise change the shape of the cone as it travels back and forth. Not only does this theory hold in the modeling software used by the engineers at API, but the evidence of its practical appeal is given by the wide acclaim of Energy subwoofers employing this technology. The RC-10 ($550 USD per pair) is on the small side even for a minimonitor. It measures 13"H x 10 1/2"W x 6 3/4"D and weighs 12 pounds. The speaker is a two-way design utilizing a 1" aluminum-dome tweeter and 5 1/2" Kevlar woofer sporting the aforementioned Ribbed Elliptical Surround. The crossover point is 2.4kHz with no slopes given. Rated sensitivity is a moderately high 88dB/W/m with a nominal impedance of 8 ohms. These numbers would suggest a relatively amplifier friendly load, but with a minimum impedance said to be 4 ohms, tube lovers should be cautious. The only interesting specification is the claimed frequency response: 50Hz-23kHz +/- 3dB, and down 10dB at 43Hz. No, these numbers do not indicate profoundly deep bass, but they are intriguing when considering the small woofer and enclosure. After unpacking the speakers, the first thing I noticed was the quality of the veneer. The review samples were finished in rosenut, a red-brown-colored wood with a medium-fine grain; black ash and cherry are also available. I know of only one other company that produces a speaker at this price point with such a high quality of real-wood veneer applied in such an expert manner, and those are single-driver speakers targeting a completely different market segment. I'm not aware of any mainstream manufacturer coming anywhere close to this finish quality at such a low price. Further refinements are the beefy binding posts (two sets for biwiring) and the exceptionally slick magnetic attachments for the grilles. Speaking of the grilles, you're only going to want to use them if you have small children with inquisitive fingers, as they do reduce high-frequency extension somewhat. Besides, the drivers are especially attractive and lend a contemporary look to the package. Although I am lucky enough to have a dedicated listening room, the elegant appearance and small size make the RC-10s compatible with placement in a multi-use room. My girlfriend preferred their appearance to that of either my Amphion or Omega speakers, both aesthetically pleasing designs. Looks might not be everything, but the level of detail apparent with the RC-10s inspires pride of ownership and a confidence that all aspects of the speaker design were thoroughly considered and implemented with meticulous care. Not only will all of your friends think that you've spent much more, you can be assured that Energy takes pride in its products. Setup was fairly straightforward. The RC-10s replaced my own Amphion Argon2s atop 30" Plateau stands filled with sand. The massiveness of these stands made the RC-10s look even smaller than they actually are, but being on the tall side myself, I need the 30" to get the speakers up to a proper listening height. The RC-10s are minimonitors, not bookshelf speakers. You will not get the best that these speakers have to offer if you place them on a shelf or up against the wall. I initially made the mistake of placing them too close to the wall, assuming that they would need boundary reinforcement. What I got, in my 14' x 13' x 7' listening room, was too much bass. Energy does provide foam plugs for the rear-firing ports, should it be necessary to place the speakers near a boundary, but you are better off pulling the speakers out into the room. I ended up with them four feet from the front wall and about six and a half feet apart, angled inward to cross just behind my head. This positioning put the plane between the speakers about seven feet from my listening position. Although the RC-10s are biwirable, I used their included jumpers to run a single pair of DH Labs Q-10 speaker cables from my amplifier. The most notable aspect of the RC-10's sound, the one that hits you right away, is the utter lack of glare or other hash in the high frequencies. While you may be accustomed to hearing speakers with a smooth top end, the vast majority of them accomplish this feat by rolling off the extreme high frequencies. Not so with the RC-10. The tweeter extends up into the stratosphere, but does so while maintaining a smoothness that has to be heard to be believed. I had been very happy with the tweeter used in my Amphion speakers, but after hearing the Energy tweeter, it seems somewhat harsh in comparison. This smoothness is a great benefit with brighter recordings, or with systems that have a top-end emphasis. On my copy of the Mobile Fidelity reissue of Alison Krauss's So Long So Wrong [Rounder MFSL 2-276], "Find the Way Back to My Heart" displays some distortion in the chorus when the other members of Union Station join in (I doubt that the distortion is on the master tape). I've found this distortion to be quite off-putting in the past. Although it is still audible with the RC-10s, it was significantly less painful to hear. Dynamic contrasts are handled very well. If you don't have any CDs on the BIS label, open another window on your browser and order a few -- yes, right now. I have found these CDs to be some of the best-sounding out there, and unlike many "audiophile" labels, BIS records real music. For assessing how a component handles dynamics, I like to use the BIS recording of the Sibelius Violin Concerto [BIS 300500]. About a minute into the first movement, there is a sforzando in the brass section coming from a sustained note in the solo violin. The RC-10s handled this violent dynamic shift with aplomb. Integrated amplifier  Graaf Venticinque. Digital  Mel Audio Rechav CD player, Philips 963SA CD/SACD player. Interconnects  QED Silver Spiral, JPS Labs Superconductor, AudioQuest Sidewinder. Even though the RC-10s are small, they can play far past my tolerance for volume without any noticeable signs of distortion or compression. What is more impressive, though, is that they were able to play at lower volumes with authority. Many speakers require a swift kick from an amp in order to sound good (my old Mirage OM-10s being a good example), but the RC-10s sounded nearly the same no matter the volume level. Judging a speaker by how loud it can play is "big box store" mentality. This system works for them because, when your ears are overloaded, it's impossible for you to make a determination of the quality of sound you are hearing. It is important for a speaker to be able to play loud, but it is more important for it to be able to play at sane levels, and sound good doing so, which the RC-10s do. The Sibelius recording is also great for examining the three-dimensionality of a stereo image. The orchestra was spread out the width of the speakers, with Leonidas Kavakoss violin just to the left of center. The RC-10s conveyed a credible sense of image depth, although with fewer layers than the best I've heard. The images were solid even when I moved my head from side to side. Minimonitors generally have good image specificity, but I would put the RC-10s above average on the curve. They don't have the laser-like precision of some speakers I've heard, but you can easily close your eyes and point to an instrument or vocalist in space when listening to the RC-10s. Bass response is nothing short of astounding for such a diminutive speaker. While no speaker this size, regardless of price, can plumb the bottom octave, the RC-10 can reach down to the lowest notes on a double bass with tunefulness and substance. Very little musical information resides below these frequencies, but those lowest frequencies do affect the sense of hall ambiance, or space, that can be heard from recordings that contain such information. In order to get a more generic idea of how low the RC-10s can play, I used a disc of test tones that I generated in Mathematica, an integrated software suite that technical people know well. In my room, the RC-10s had solid output down to 50Hz and could still be heard at 40Hz. At 30Hz and below, output was essentially zero. If you feel that you need more bass output than that, Energy will be happy to sell you one of the three larger siblings to the RC-10, but most music listeners will probably be delighted with what the RC-10 has to offer in the bass. I reviewed the Connoisseur C-3s back in 2002, and that speaker not only received a Reviewers Choice nod but won our year-end Budget Leader award as well. At the time of the review, the C-3 was $500 per pair, which was a great deal; later on Energy lowered the retail price to just $300, making the C-3s an astonishingly good deal. Could Energy do better? Honestly, I didnt think so -- until I unboxed the $550 RC-10s. With beautifully finished real-wood-veneered cabinets (the C-3 looked nice, but it was vinyl clad), rather exotic-looking drive units, binding posts that wouldnt look out of place on speakers double or triple the price, and magnetically attached grilles, the RC-10s set a standard for build quality that no other bookshelf speakers that I know of near their price can match. Oh, yeah, they sound great too, bettering the C-3 in every way except for a little bit of bass weight. (The C-3 had a 6 1/2" woofer and a larger cabinet, which seemed to give the speakers a slightly bigger sound.) Still, even if its not quite as fleshed out down low as C-3, the RC-10 has shockingly good bass for its size, along with detail, control and articulation that better the C-3's and which I never thought possible from such a low-priced two-way. The midrange is very clear and devoid of congestion, but its the top end that sends this little speaker over the top. The RC-10s tweeter is so sweet-sounding youd swear that Energy built this driver for a speaker four times the price. Why do I say that? The RC-10 doesnt quite match, but does come close to, the performance of the Paradigm Signature S2s tweeter, which I consider a reference -- something I wouldnt expect from a speaker half the S2s price, let alone about one-quarter of it. As a result, the RC-10 is as amazingly refined-sounding little speaker. If the RC-10 has a weakness, its that it is the perfect speaker for a small- to medium-sized room, but not a really big one. Put it in a room thats too big, and despite the more-than-impressive bass for its size, it will still likely sound small. After all, it is a rather compact speaker. There are bigger RC-series speakers -- floorstanders, in fact -- for filling large spaces. If the RC-10 cost twice the price (and I suspect it would if a boutique company that doesnt have the engineering wherewithal of Energy produced it), some audiophiles might nit-pick about this, that, and the other thing. Maybe someone would want more presence in the mids, and maybe someone would want the speaker to sound more relaxed. But at what Energy is asking for the RC-10, theres really not one nit to pick. Put the RC-10s in the right room and partner them with good-quality components, and youll be rewarded with outstanding minimonitor sound at a ridiculously low price. Energy has not only bettered the older Connoisseur-series speakers, they have redefined my expectations for inexpensive speakers. Bass depth is only one aspect of the bottom-end performance of any loudspeaker. The RC-10 was well controlled down low, never bloated or boomy. Bass lines moved along in a lively fashion, and routinely started my toe a-tapping. While the bass was never muddy, neither was it as precise as the best that I've heard. The timpani on Brendel's recording of Beethoven's Emperor Concerto [Philips 289 468 666-2] was clearly audible, but it lacked some of the crispness that I hear with my reference speakers. It sounded as though the timpanist was using a softer mallet with the Energy speakers than when played through the Amphions. Similarly, acoustic-bass solos as on the Andrea Pozza Trio's Sweet Loraine [Venus TKJV-19154] were sufficiently weighty, but not as articulated as I would prefer. Notes did not blend into each other; they just did not have a precisely defined beginning. 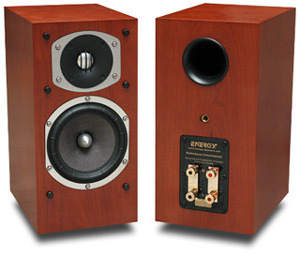 The matching of a pair of loudspeakers to an amplifier is critical for achieving the desired sound. My Graaf Venticinque is a 25Wpc push-pull tube design running in pure class A. It is not an especially tubey-sounding amp in the sense of having a great deal of bloom in the low end, but it is still, electrically speaking, a tube amp. Although rated into 4 ohms, it will not drive all loads evenly. My Amphion speakers are exceptionally tube friendly, with an impedance that never drops below 7 ohms. In general, I felt that the RC-10s were very compatible with this amplifier, but I do suspect that a solid-state design, even of moderate power output, would have taken tighter control of the woofer and produced a more articulate bass. The RC-10s had a grand sense of scale. While they can't move as much air as a speaker with much larger drivers, they can produce the heft required to listen to a full orchestral recording at reasonable levels (and even a bit beyond reasonable). If you close your eyes, you'd swear that you were listening to small floorstanders. It would be a shame to keep your eyes closed, though, because Energy has gone to the trouble of making such a visually attractive speaker. The bass of the RC-10s has a very tangible quality, which I found incredibly involving. Whereas many audiophile speakers can open a crystal clear window onto a recording, the physicality of the RC-10s does more to bring the music to you. While listening to Jimi Hendrix Live at Berkeley [Experience Hendrix B0001159-01], I got so involved in the experience that I could almost smell the pot smoke. Physicality is not just the sense that your speakers are hitting you in the chest with a sledge hammer, but an organic presence to the music that excites the body and soul, not just the mind. The RC-10s accomplish this -- for $550 per pair. Comparing the RC-10s to my reference Amphion Argon2s might not seem quite fair, since the Amphions now retail for nearly four times the price of the Energy speakers ($1950 per pair), but the RC-10s are good enough to make such a pairing interesting. Energy and Amphion embrace similar design philosophies of flat frequency response both on and off axis, and wide dispersion. What that means to the listener is that both companies manufacture speakers that test well in an anechoic chamber, but also work well in real-world listening rooms. Although the RC-10s don't extend quite as low as the Argon2s, they seem to be just as flat throughout their frequency range. Both designs have clean, extended bass and can play big. Unless you have a very large room, you are unlikely to notice that you did not buy a floorstander, except for the extra money in your pocket. In some ways, though, the RC-10s sounded bigger. The bass did not extend as low, but it was weightier than that of the Argon2s. At the other end of the frequency spectrum, both speakers seem to be equally extended, but the Energy speaker accomplishes its extension with a polish rarely heard at any price. If you find yourself often feeling listening fatigue but don't want to give up all that goes on in the highs, this area is the one in which the RC-10s stomp all over their competition. One area where the Argon2s pull ahead of the RC-10s is in tonal complexity. I am not talking about being able to hear the difference between violins and violas (a speaker that doesn't exhibit that distinction has no place in an audiophile setup), but some of the subtle harmonic difference between, for instance, two trombones (the instrument I play and know best) or two similar pianos. In part, it is these subtle harmonic cues that make some speakers sound more like real instruments than others. As much as I have tried to keep price out of my assessment of the RC-10s, I do have to think that equipment that is likely to be partnered with these speakers is not likely to convey a higher degree of harmonic texture than the RC-10s are prepared to deliver. While much of the music I used to audition the RC-10s was very familiar to me, one recording that arrived during the review period was Sweet Loraine by the Andrea Pozza Trio, which I've mentioned. This group has managed to put some life into such tired standards as "I'll Be Seeing You" and "Alone Together." I ended up listening to this record a number of times, and I never got tired of it. The recording quality is as excellent as the musicianship, and I felt like I was alone in a club after hours with these guys playin' away. When I switched back to my Amphions, I heard something that I didn't recall hearing before. The bassist seems to sing along to mark time in his solos. I switched back to the RC-10s and played it again. While I could make out the vocalization, it was not as apparent as with the Amphions. Sometimes these sounds can be distracting, but in this case, hearing them added to my enjoyment of the easy swing feel. I suppose that at one quarter the price, I can forgive the RC-10s that last smidgen of resolution. The greatest difference between the two speakers, and one that cannot be judged in terms of better or worse, is the overall character of the sound. The RC-10s are exceedingly precise. They are not cold, lifeless, or sterile -- far from it. They convey the music being fed to them, nothing more or less. The Amphions, on the other hand, are a touch more romantic. The best analogy I can give is that the RC-10s are like the best modern concert halls, while the Argon2s more closely resemble a hall from the 19th or early 20th century. Listening to live music in either hall is a treat, but some people will prefer one over the other. I prefer the Argon2s, but not by as wide a margin as I had expected. 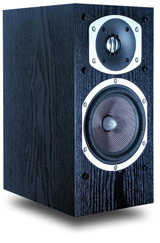 If I were shopping for speakers right now, I very well might buy the RC-10s and spend the $1500 I saved elsewhere. No speaker is perfect, and while the RC-10s have some shortcomings, they are relatively minor. Their sonics and manufacturing quality put them in a very competitive position with speakers in the $1000-per-pair range -- almost twice what they cost. In regard to their ultra-smooth top end, they can compete with any speaker I've heard, and better most of them. Their bass response belies their small cabinet and driver size. At their asking price, they are simply without equal. The competition has a lot of catching up to do.